Don’t you just love it when you get fun stuff in the mail? Normally the mailbox is full of bills, so it’s nice to get stuff that you actually want sometimes. Well, my mailbox has been full of little surprises lately. Today I received the sweetest thank you note from Ashley at Wasn’t Quilt in a Day. Ashley was one of the winners of the pin cushion give-a-way I did last month. 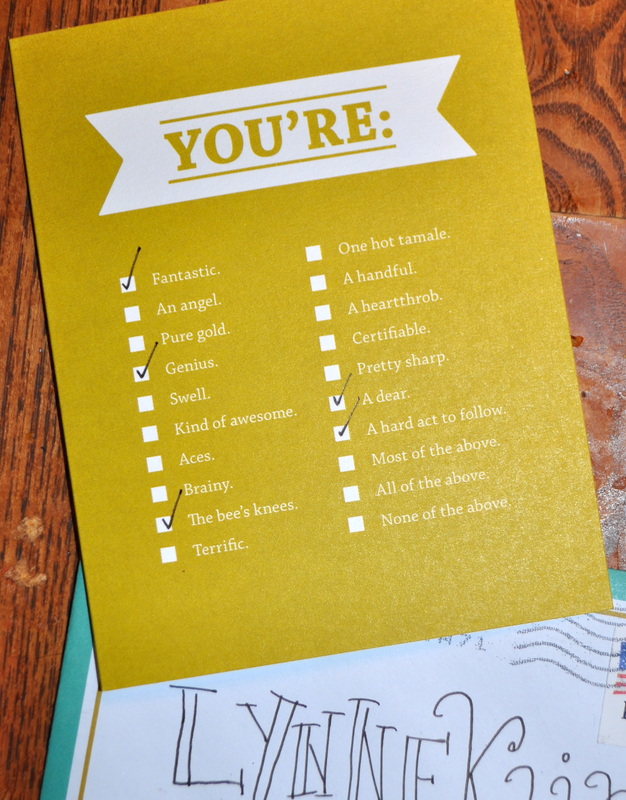 And the fact that she took the time to hand write a thank you note and post it in the mail is super nice. I honestly didn’t know folks did things like that any more. She lives in Jersey, but I’m wondering if maybe she isn’t a Southern girl at heart. And although she is fairly new at quilting, let me just say that she is on a roll making beautiful quilts and her excitement is contagious! Go check her out… I know she’ll end up being one of your favorite bloggers. Then last week, I had new fabric arrive two days in a row. It was Christmas in August. First, I was the lucky winner of a $15 gift certificate to the Fat Quarter Shop given to me by Richard and Tanya Quilts as part of their Link a Finish Friday. Oh yeah! I almost never win anything… and I won and couldn’t believe it! And boy did I make the most of my winnings. 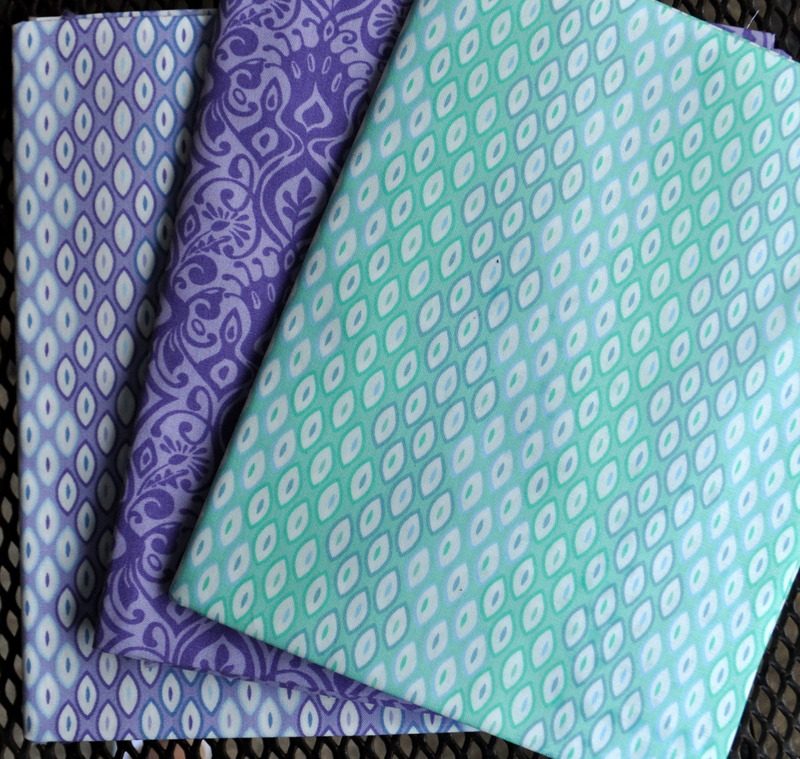 I shopped from the 50% off category and was able to buy three whole yards of delicious Moda fabric. With my gift certificate, it cost me just $1 plus shipping. I like that kind of shopping. Be sure to visit Richard & Tanya — they are super nice folks. Then the next day, I was blessed to receive a box from Art Gallery Fabrics. Remember the umbrella I made and entered into their Make it Right Challenge. Well, I didn’t win the popular vote. I’m not surprised really. Although I had a good entry, I don’t have a ton of friends or a huge following of folks that would likely vote for me. But, I did win the ‘Most Creative’ category as voted on by the Art Gallery Fabrics designers and staff which is a huge honor. I didn’t know what to expect as part of the swag bag, so I was super excited to open the box. 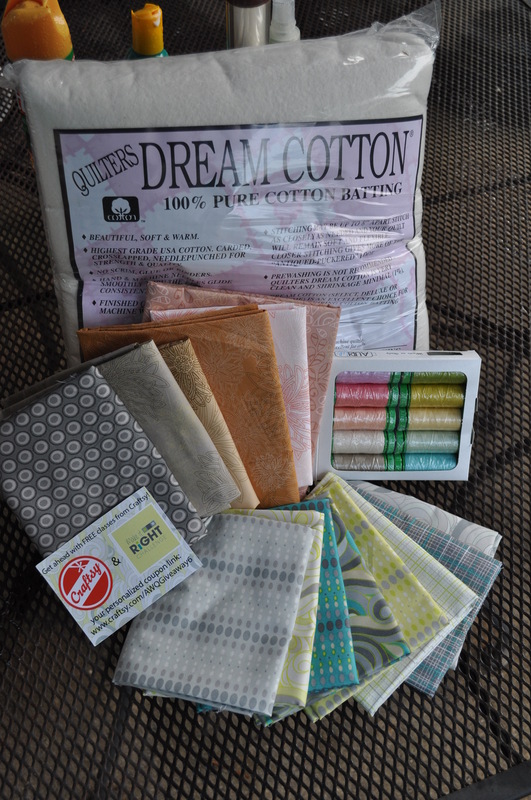 Look at what I found — a twin size pack of cotton batting, an 8-fat quarter pack of the Textures fabric line by Angela Walters, a 6-pack of various other Art Gallery Fabric lines (each piece is between 17″-25″), a 10-pack of beautiful Aurifil thread, and a free Craftsy class. How exciting is that! It’s been a while since I posted a finished project… in fact it’s been a while since I posted at all. It’s been a busy summer but I have managed to get one or two things done. I made this baby quilt with the same fabric that I used for the umbrella. 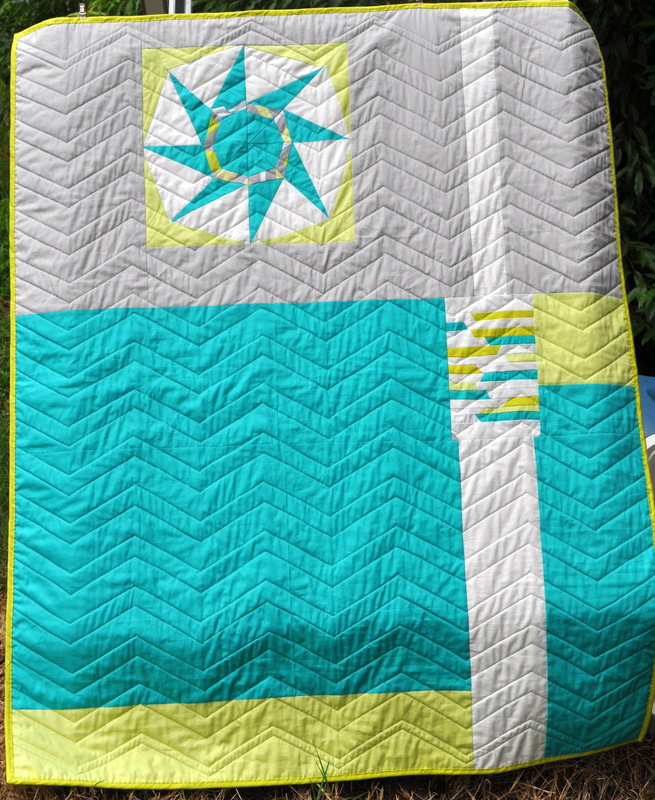 I like the chevron pattern, although I think I went about making it the hard way. Next time I’ll know better. I used left over scraps for the back. I had a few other blocks made with the scraps, but I decided that including all of them would make it too busy. I guess they’ll find their way into another quilt at some point. 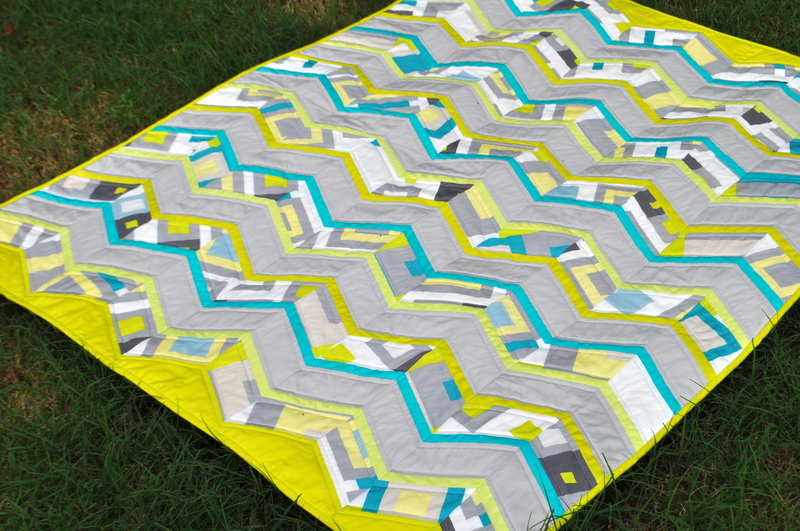 This entry was posted in Quilting/Sewing and tagged agf, baby, chevron, fabric, goodies, mailbox, note, quilt, swag, thank you, win by monkeyneedle. Bookmark the permalink. Beautiful quilt. Congratulations on your win – so nice to see 2 wins from WordPress bloggers in the same contest. Love your quilt, front and back! And it doesn’t surprise me at all that you won the “Most Creative” entry – that umbrella is awesome! Whoop whoop! !